In Tasiilaq on Greenland’s East Coast infrastructure and the urban support systems are present and highly visible in the town. This provides a contrast to modern cities in other parts of the world—in which infrastructure is often both visually and geographically removed from the everyday lives of the inhabitants. According to the Danish researcher Kåre Hendriksen, Greenland is the world’s largest micro-state in an economic sense. Its small domestic market relies heavily on import of goods and specialized expertise in a number of fields. It is also a mono-economy, with fishing dominating the export. In addition to being an island nation, its vast geography and lack of land-based infrastructure means that it’s towns and cities are economic islands in themselves, disconnected from any regional labour market (Hendriksen 2014). Tasiilaq is the largest town in eastern Greenland, separated from the more populated West Coast by the Inland Ice Cap. No roads leave the town, which is located on an island off the mainland, and seven months a year the frozen Arctic Sea prohibits ships from entering its sheltered harbour. Contact with the outside world is tenuous; the capital Nuuk and the Icelandic capital Reykjavik are both around 700 kilometres away, flight and helicopter services are may be unreliable due to weather conditions, ships may be blocked by sea ice, and telecommunication all takes place via satellite. 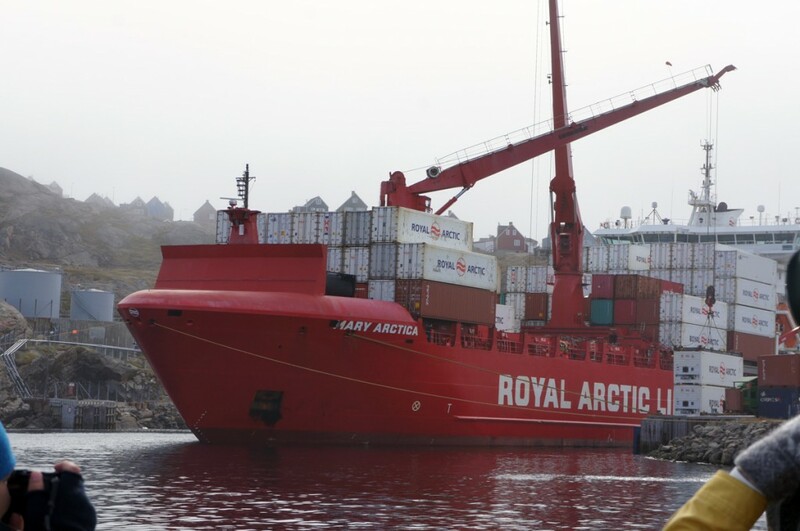 All supplies to the town arrive in containers on scheduled ships from Denmark when the harbour is open, and containers are stacked high, waiting to be opened as need and demands requires. Supplies outside the sailing season are impossible or limited to the carrying capacity of the town’s helicopter. Located far away from any other towns, and the centre of a vast district, Tasiilaq has “everything”: not only school, hospital, kindergartens, dwellings and infrastructure, but also a court house, an orphanage, a jail, and a sizable industrial area catering to the practical and material needs of the town when the only contact with other towns are by air. What it does not have is a sewage treatment plant (sewage is pumped directly into the sea) and garbage is simply deposited in a dump by the harbour, which greets visitors arriving by boat or helicopter. The logistical system primarily works one way: goods come in, but very little go out. 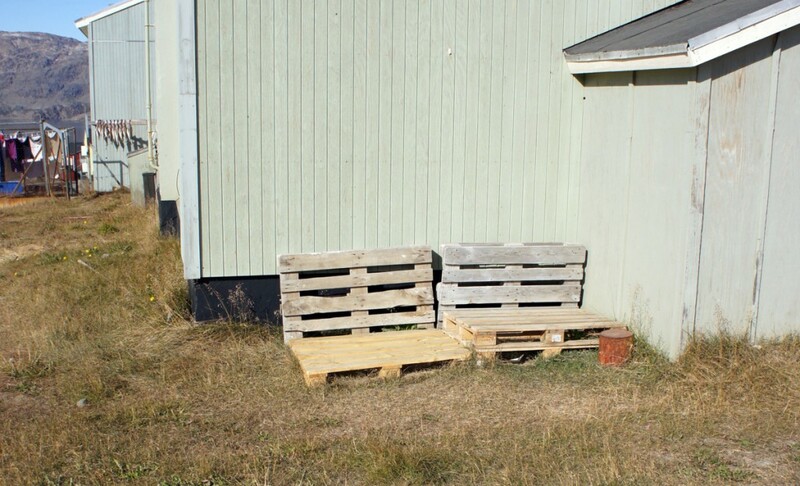 The left-overs from this logistical operation are visible in the town: Cargo pallets are used for everything from improvised bridges over melting water ditches to impromptu benches when the sun comes out, and shipping containers find a second life as storage sheds or house extensions. The town has few cars, and reliance on other means of transport results in a compact urban form where people move about on foot (when not on snowmobiles and dog sleds). As no roads leave the town, the servicing technical, infrastructural and logistical functions are not located outside the settlement. Rather, full and empty shipping containers dominate the historic buildings on the harbour, radio masts and satellite dishes mark the skyline, electricity cables run over open ground. In Tasiilaq (as in other Greenlandic towns), the technical infrastructure is celebrated with its own particular color-coding: blue for water and electricity related structures. Looking more closely one realizes that infrastructure is not always innocent. Most people benefit from them, but they also sometimes create negative effects for some. 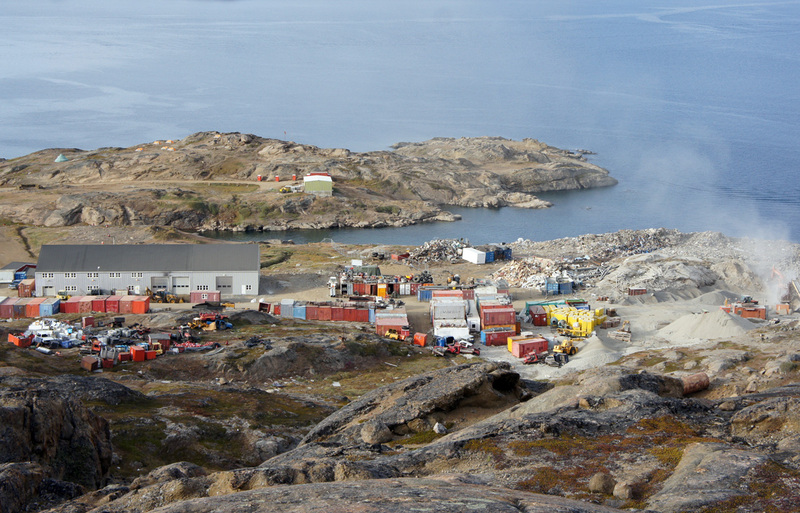 For instance, garbage collection may be a positive thing for all inhabitants in Tasiilaq, but for the people living close to the landfill site the view out the window is not so great, and with the occasional powerful northern storms trash becomes airborne. The residents in question are also neighbours to the heliport and the prison, and a range of industrial functions—all located in the ‘dirty’ end of town, and in addition, these houses in the southern part of town are also among those that still do not have running water and sewage. Along with other infrastructural systems, the town has a its own hydro-electric electricity supply. Being “off-grid” and self-contained is a characteristic of many Arctic settlements, and Tasiilaq is not only an island in an economic sense, but also when it comes to infrastructure. Its minimal external connections and wintertime isolation, means that the city has to be able to operate autonomously—as a material ‘island’—for extended periods with all the services and material support of modern society. All this means that Tasiilaq—as well as many other Arctic cities—is configured physically and visually different from standard European or North American style cites. Here, nothing is hidden, and “everything” is there. The city is easy to read as a technical urban system, and when it fails, it is easy to see where and understand why. Hendriksen, K. 2014. Driving forces in the Greenlandic urbanization, Unpublished Paper, The Arctic Technology Centre, Department of Civil Engineering, Technical University of Denmark.